New and promising technologies of renewable and alternative energy production are already here, waiting to be used. Knowledge based barriers stand in the way of this potential for the creation of a very large number of jobs. An OIKOS-International Summer Academy for Young Scholars will be held at Tel Aviv University with support from St. Gallen, Switzerland based, Oikos – June 7-11, 2015. June 7-11, 2015 – Tel Aviv University, Israel. the Department of Public Policy at the Gordon Faculty of Social Sciences and the Porter School of Environmental Studies. New and promising technologies of renewable and alternative energy production are already here, waiting to be used. Knowledge based barriers stand in the way of this potential for the creation of a very large number of jobs. First, there is the misconception that new mechanisms to produce cleaner and more reliable energy are expensive. Then, there is the significant concern about the challenge of distributing the energy coming from these new sources. The decentralized nature of new methods of energy production and the challenge they entail for the distribution grid and its nature are central concerns. The third domain is the potential for city renewal, public transportation and public health. If we accept the idea that avoiding climate and nuclear risk is beneficial in the long run, we start asking questions such as how can societies, firms and consumers change track towards a new energy paradigm? How can “investment-grade” policies be designed to efficiently and effectively govern the transition towards renewables? What should we do in order to accelerate the diffusion of such technologies? What are the implications of mass diffusion? How can policies and investment strategies be adapted as renewables move from niche to mainstream market? How can decision-makers in companies overcome the challenges of path dependence? What distinguishes decision-makers who see opportunities in clean energy from those who perceive it as a threat, and how do their attitudes and values influence their behaviour? Is the accelerating evidence of the climate crisis going to accentuate polarization, and if yes, what are the implications for building successful transition strategies? Which end-of life strategies can be identified to smoothen the late non-renewable era, and which counter-dynamics are likely to occur? In June 2015, Tel Aviv University, the University of St. Gallen, and oikos will host a special workshop to discuss these issues with young scholars and four leading faculty members from four different disciplinary perspectives. Building on a 14 year tradition of international academies in the field of Sustainability, Strategy and Entrepreneurship, the oikos Young Scholars Energy Academy 2015 provides an intense 4-days academic platform for identifying and advancing relevant and rigorous research. Young scholars are encouraged to share research and conceptual ideas, covering theoretical and empirical contributions on the intersection of Decision Sciences, Policy, Finance, Management, Entrepreneurship, Innovation, Sustainability and beyond. We invite advanced PhD students and young PhDs to apply to partake in this workshop to be held at Tel Aviv University, between June 7-11, 2015.
still in progress. Finally an active program of exchange of ideas and experiences will make sure the group’s strong multiplier impact on the domain of energy production and utilization around the globe. The emphasis in the program is collaboration for learning, and dissemination of knowledge with students from various universities, research institutes and laboratories. This program creates a network of information, common language and community partnerships for the benefit of the research and the young scholar’s professional life. * Create long term collaboration between scholars from multiple disciplines in area of sustainable energy management. The academy will gather 20 carefully selected international PhD students and young faculty focusing on energy investment, policy and decision-making with four senior faculty members. The academy is also designed to strengthen a global network of young researchers who aim at combining academic rigor with practical relevance. Presentations by senior faculty on research and research designs, finding an audience, getting published and developing teaching skills. These presentations and interactive discussion sessions provide participants with a strong basis and understanding of how to develop solid research projects that have an impact. In a panel discussion, forward-thinking practitioners from the energy policy and finance community reflect on their view of current challenges, inspiring young researchers to consider how their work can best be framed to increase their societal impact. Paper presentations and feedback sessions allow PhD students and young faculty to present their paper and research proposals and receive feedback from fellow participants and senior faculty. The goal is to raise the academic quality of the research projects and papers and prepare them for publication in leading journals. The papers are distributed to the participants a month prior to the academy. Rolf Wüstenhagen, Good Energies Chair for Management of Renewable Energies, University of St. Gallen, Switzerland. Participating young researchers pay a registration fee of US$ 500. This includes tuition, food and accommodation. Participants will have to cover their own travel cost. To allow in-depth discussions the oikos Young Scholars Energy Academy is limited to 20 PhD students and Post-Docs / young faculty. (3) a letter of interest in the oikos Young Scholars Energy Academy. Please send your application by February 25, 2015 to the Chair of the Department of Public Policy, at chairpubpol at post.tau.ac.il. In the Geneva Race to Paris 2015 – Langston James Goree VI reports that the first day ended with a feeling that there might be cooperation between the speakers for groups. It is an American and an Algerian who co-chair the session 2.8 of the ADP. On Sunday morning, the ADP opening plenary took place. In the morning and afternoon, the ADP contact group on item 3 (implementation of all the elements of Decision 1/CP.17) convened. ITEM 3: Co-Chair Daniel Reifsnyder (US) underscored the objective of delivering a negotiating text on Friday and that the main task of the ADP contact group will be to ensure that the text fully reflects parties’ positions. Parties agreed to the proposed organization of work. South Africa, for G-77/CHINA, noted that: the elements for a draft negotiating text annexed to Decision 1/CP.20 (Lima Call for Climate Action) are not fully negotiated; streamlining of options must be based on consensus; and parties’ views must be reflected in the text in a balanced manner. The EU urged progress on: ensuring dynamism in the 2015 agreement through regular review of ambition; clarifying how the agreement will deliver transparency and accountability with respect to mitigation; delivering climate resilience through adaptation and climate finance; and enhancing mitigation before 2020. Australia, for the UMBRELLA GROUP, proposed distinguishing content that needs to be included in a legal agreement from content that is more appropriate for a COP decision. Switzerland, for the ENVIRONMENTAL INTEGRITY GROUP, proposed break-out groups to address specific issues and urged focusing on streamlining the text. GENERAL/OBJECTIVE: On Section C “General/Objective” Co-Chair Reifsnyder suggested bracketing it and reflecting that some parties feel that the Section is not necessary. Parties made suggestions to add text and identified opportunities for consolidation. The US questioned the need for a separate Section on objectives. BRAZIL identified the Section as necessary to explain why a new agreement is needed. SAUDI ARABIA suggested omitting the Section, but if retained, then reflecting the objective in one to two paragraphs. Several parties suggested focusing the Section on the agreement’s overall objective and including details on how to achieve this objective elsewhere. SINGAPORE called for addressing the relationship between the Convention and the new agreement. Maldives, for AOSIS, called for a reference to science on keeping the average temperature increase below 1.5 °C. JAMAICA proposed text on ensuring significant and rapid global greenhouse gas (GHG) emission reductions of at least 70-90% by 2050. The EU underscored the need to reach zero net emissions of CO2 and other long-lived GHGs by the end of the century to ensure consistency with the IPCC Fifth Assessment Report. SWITZERLAND agreed on the need to reflect the objective of achieving zero net GHG emissions. BRAZIL warned that references to the IPCC could lead to politicization. Sudan, for the AFRICAN GROUP, highlighted a new proposal on loss and damage. AOSIS underscored the need for high ambition from all parties; interlinkages between mitigation and adaptation; and addressing loss and damage. BRAZIL lamented that parts of the text are not in line with the Lima outcome, such as references to “evolving CBDR.” He supported undertakings by all Parties. The US proposed categorizing developed and developing countries into two new annexes. Malaysia, for the LMDCs, called for addressing adaptation with the same urgency as mitigation. He proposed emphasizing, inter alia, the link between developing countries’ mitigation actions and enhanced support by developed countries; and that developed countries must not resort to any unilateral measures on climate change. SAUDI ARABIA suggested combining text on ensuring resilience and adaptive capacity with text on ensuring that all investments are resilient to climate change. Several parties supported including text on gender equality. Tuvalu, for the LDCs, identified similarities between the proposals. MEXICO, supported by UGANDA, CHILE and BOLIVIA, also suggested text on human rights. Tuvalu, for LDCs, called for language on universal participation, human rights and rights of people with disabilities. Co-Chair Reifsnyder indicated that informal discussion on the Section can be reconsidered at a later stage. He expressed satisfaction with progress made and said parties’ proposals together with revised Section C will be made available online promptly. MITIGATION: In the afternoon, the contact group focused on Section D on mitigation. Argentina, for the LMDCs, underscored, inter alia, that commitments, contributions and actions should comply with the Convention’s principles and obligations, with developed country parties undertaking quantified emission limitation and reduction objectives (QELROs) that are comparable, verifiable and implemented without any conditions. She added that developing country actions may include REDD+ and joint adaptation and mitigation, in accordance with their specific circumstances and needs. Chile, for AILAC, suggested text on distinguishing between ex ante and ex post review of INDCs, proposing that all parties make successive mitigation commitments. On the use of market mechanisms in the land-use sector, he suggested including references to: environmental integrity; avoiding double counting; and a levy to support climate change resilience in developing countries. Panama, for CfRN, called for: the REDD+ framework be reflected and anchored in the new agreement; applying safeguards; and strengthening institutional arrangements under the Convention based on Decision 10/CP.19 on support for the implementation of mitigation activities in the forest sector by developing countries. The EU, inter alia: emphasized accounting rules and suggested bringing these from the Section on transparency of action and support, into the Section on mitigation. He proposed separating text on land use and market mechanisms. He highlighted the need for parties to periodically review and update their commitments. AUSTRALIA proposed text on national schedules and intended mitigation contributions, including that each party individually update their respective national schedules in accordance with modalities to be agreed by the governing body. Kenya, for the AFRICAN GROUP, emphasized developed countries’ obligation to provide MOI, and that social and economic development and poverty eradication are first and overriding priorities for developing countries. Maldives, for SIDS, proposed, inter alia, that proceeds from the use of market mechanisms will be used for meeting the costs of adaptation in the most vulnerable developing countries. Underlying the importance of text on peaking of global GHG emissions as soon as possible, TANZANIA proposed text specifying these efforts be quantitative and time-bound for developed countries and aspirational for developing countries. The US proposed replacing references to developed or developing countries throughout the text be replaced with reference to new annexes y and x. He proposed text to provide clarity on how parties engage in consultations on future cycles of contributions, specifying that parties should submit INDCs no later than six months before the beginning of each cycle. CANADA proposed text suggesting that all parties prepare national inventory reports in accordance with IPCC guidance. BRAZIL suggested text on an economic mechanism comprising an emissions trading system (ETS) and an enhanced Clean Development Mechanism (CDM+). He explained that parties with quantified mitigation targets could use ETS and CDM+ to supplement domestic action, and developing countries may participate in CDM+ projects on a voluntary basis. He emphasized voluntary cancellations of Certified Emission Reductions (CERs) to enhance environmental integrity, saying cancelled CERs could be used to meet quantified financing targets or pledges but not mitigation targets. SENEGAL stated that market mechanisms and actions in the land-use sector should contribute to the sustainable development of the host countries. He proposed a centrally governed market mechanism under the Convention, building on existing market mechanisms. ETHIOPIA announced a new submission clarifying the details of market mechanisms in the 2015 agreement. SOUTH AFRICA stressed review as an integral part of a dynamic contribution cycle. She proposed text on common accounting rules to be developed by the COP. NEW ZEALAND noted that accounting rules must be more explicitly addressed in Section D, and, with NORWAY, stressed the importance of avoiding double-counting. BOLIVIA stressed the need for inclusion of alternative, non-market, and joint mitigation and adaptation approaches, and for adding text on “the protection and integrity of Mother Earth.” On a global emission budget, ETHIOPIA proposed including a reference to national per capita emissions and taking into account historical emissions. On a cold but sunny Sunday morning, delegates arrived in the historic Palais des Nations for the first of several negotiating sessions leading to Paris. Many felt the meeting got off to a good start. The opening plenary was described as “surprisingly short” and many expressed appreciation for the gesture by many negotiating groups to submit their opening statements electronically in the interest of time. Having consulted with the negotiating group leaders, the Co-Chairs proposed to speed things up and collect all new textual proposals on Monday in order to focus the rest of the session on streamlining the text. On that note, many delegates said they anticipated a late evening to finalize negotiating groups’ internal coordinations on new text. The Final Stretch to Paris 2015 – the Ad-Hoc Durban Platform (ADP) for Enhanced Action – the Eights Part of its Second Session ADP2.8 – starts today in Geneva. GOOD LUCK! The eighth part of the second session of the Ad Hoc Working Group on the Ad-Hoc Durban Platform for Enhanced Action (ADP – Ad-Hoc Durban Platform) will be held from 8-13 February 2015 in Geneva, Switzerland. Negotiations under the United Nations Framework Convention on Climate Change (UNFCCC) – the conference is the first conference of several meetings in preparation for the Paris Climate Change Conference that will be held in France in December. The Paris Conference is mandated to adopt “a protocol, another legal instrument or an agreed outcome with legal force under the Convention applicable to all parties.” The agreement will be implemented from 2020 onwards. The body tasked with developing the Paris Agreement is the Ad Hoc Working Group on the Durban Platform for Enhanced Action (ADP). In Geneva, the ADP will hold the eighth part of its second session (ADP 2-8). – Thirteenth Informal Meeting on Further Actions against Climate Change (28-30 January 2015, Tokyo, Japan). The Co-Chairs consult groups of Parties in the days immediately prior to the session. The Cochairs are: Mr. Ahmed Djoghlaf and Mr. Daniel Reifsnyder and Ms. Yang Liu as the Rapporteur of the ADP, to serve until the conclusion of the ADP session to be held in conjunction with COP 21 in 2015. ECO is a daily newsletter published by a group of NGOs active at UN Conferences – not as a reporting service like the ENB of the IISD that is backed financially by several Western governments, but rather as an outlet of several opinionated Civil Society groupings. Managing the bumps on the Road to Paris. The dust from COP20 has (barely) settled and now with just 10 months left before COP21 in Paris, Parties need to come together on the way forward to the 2015 agreement. In Geneva, Parties will start from where they left off the draft negotiating text that is annexed to the Lima Call for Climate Action decision of COP 20 of the UNFCCC. The current draft has many options on most issues, some of them highly divergent. There are several key issues that need to be grappled with if we are to get a robust and ambitious post-2020 agreement in December. One of the most difficult is coming to a shared understanding of CBDR&RC (differentiation). This is at the heart of many of the divergent areas, and the differences were just papered over with the last-minute compromise of language in Lima. ECO believes that the earlier Parties attempt to move towards a common understanding on this issue, the easier it will become for the negotiations to make progress towards an ambitious outcome. The need for a clear and transparent review mechanism within the Paris agreement is another issue. Even though there was no agreement in Lima to conduct a review of the first round of INDCs, an institutionalised review mechanism that not only assesses progress, but also enables countries to plug the ambition gap, is key to the environmental integrity of the agreement. Civil society needs to be an active participant within this review and it should be conducted in earnest, and in 5-year intervals. The UNFCCC has in the past seen many reviews that only point to the problem without enabling solutions. The review mechanism within the 2015 agreement needs to be different: it should enable and equip countries to bridge the gap between what science requires and what is being put on the table by each country. This week, Parties should work to narrow down the options in the current text and clarify ideas they had presented earlier in order to produce an acceptable legal negotiating text by the end of the session. As parties start discussing Section C of the draft negotiating text today, here are some suggestions. First, the agreement should state an obvious fact which even ECO’s uncle and aunt would understand: the lower the level of mitigation ambition, the higher will be the adaptation needs, and the loss and damage from climate change impacts and the associated costs thereof, which will require much higher support to vulnerable countries and people who have not caused climate change. A good basis for addressing this continuum of mitigation, adaptation and loss and damage in Paragraph 4 of the current text. In today’s thematic session, Parties should support this language, and make further efforts to operationalise it. ECO believes the phase out of fossil fuel emissions and phase in of 100% renewable energy as early as 2050 should be the long-tern goal of 2015 agreement. Language reflecting this option should be added to the text coming out of Geneva. The text should also note that achievement of this goal rests on up ramping mitigation ambition within the pre-2020 period, as well as countries putting ambitious INDCs on the table in Paris. Such timely action will not only reduce costs in the longer run, but can ensure that climate impacts are curtailed early on. While these bumps collectively might appear daunting, they can be overcome through a mix of political will and good faith negotiating. People, businesses, and local authorities across the world are already showing the way; ECO calls on Parties here in Geneva to do the same. Pathway to zero: Career coaches assert that in order to be successful, you need to have a clear goal for what you want to achieve, then develop a pathway to get you there. Today’s negotiations on the long term goal of the Paris agreement are, therefore, critical to help define our ultimate objective. That is: to reduce carbon emissions to zero and achieve a 100% renewable-powered world by 2050. To have a likely chance to remain within the maximum 2°C warming threshold, the IPCC has provided us with a carbon budget of 1000 gigatonnes (CO2eq). That’s it. It’s all we can spend until we achieve the magic zero by 2050. If current trends continue, we’ll have spent a full third of it by 2020. A growing number of companies, have endorsed staying within this carbon budget, recognising that the benefits of action far outweigh the costs of climate impacts. Unilever’s CEO is just one of many calling for zero emissions by 2050. The good news is that economics, as well as climate considerations, are already defining the end of the fossil era. China’s 2014 decline in coal use shows that with political determination and strong targets and measures, the world’s highest emitting country can peak their coal use well before 2020. The Economist recently reported that Saudi Arabia’s profligate energy consumption means that “the country may have no oil to export by 2030” ? a real spur for domestic innovation and diversification. Clean energy is already the low cost option. In Jamaica, the price of solar power is the same as that of wholesale fossil-fuelled power and in Nicaragua, electricity from wind is half as expensive as power from traditional sources. Renewables are rapidly becoming cheaper all over the world, making the 100% renewable goal ever more attractive, and the decline of fossil fuels an ever-clearer reality. And back here in Geneva, much of what needs to be in the text for today is already there. A few changes to C3.1 Option b, so that it requires global GHG emissions to fall by 70% (not 50%) and to achieve zero carbon emissions by 2050, gets us to where we need to be. Adding a reminder that we need to transform the energy system so that we have “100% sustainable and renewable energy that meets the needs of all” seems like a goal to endorse. “Parties shall, in all climate change-related actions, respect, protect, promote and fulfill human rights for all”. 240 organisations endorsed this language in a submission to the ADP co-chairs yesterday. It’s also what each of the 76 independent experts of the UN Human Rights Council recommended in a joint statement to the UNFCCC Parties during COP20. Looks familiar, right? Yes, yes, it’s a lot like what’s in the shared vision of the Cancun Agreements. Since Cancun, however, we have noticed that this reference hasn’t done the job of ensuring that rights are adequately considered in climate policies. This language in Section C will help ensure that these principles apply to all pillars of the Convention. Today is the day to make sure it lives on in Paris! Why, you ask? Well, we can’t escape the fact that climate change has human consequences. The lives and livelihoods of literally billions of people are riding on what comes out of this process, and this language is relevant to every element of the negotiating text. It’s also nothing new. Parties already have human rights obligations. This language, as in the Cancun Agreement’s shared vision, helps spell that out in the context of climate change. And it helps make sure that Parties are looking out for their own people. No matter what delegation or constituency you represent, you care about your people. ECO knows you do. After all, you are a person too. So as we kick off this week of negotiations, ECO and 240 organisations call on you to make sure Section C ensures that Parties respect, protect, promote and fulfil human rights for all. That shouldn’t be controversial, so just go do it! When ECO thinks of Switzerland we think of skiing, watches, neutrality, delicious chocolate and of course, the Environmental Integrity Group. ECO appreciates that Switzerland negotiates as part of a group with the stated priority of “environmental integrity”, but we wonder about Switzerland’s own integrity when it comes to its domestic emissions and commitments? During the Multilateral Assessment in Lima, Switzerland became very evasive when asked why it would not opt for a conditional target of negative 30% emission reductions by 2020. Perhaps it’s because the country, to date, has merely achieved stabilisation of its absolute emissions. Switzerland offers population growth as a cheesy excuse for this lack of ambition. However, there is much more that Switzerland can do—like instituting policies to switch its population off of high-emitting oil heating systems, reducing per capita car ownership, addressing the startling fact that that average Swiss citizen racks up double the annual air miles of people in neighbouring countries. ECO hopes that Switzerland will admit it has been off piste when it comes to climate ambition, and demonstrate its integrity by delivering on its 2014 United Nations Climate Summit announcement that it will become carbon neutral. Minister Doris Leuthard, who made that commitment in New York last September, is in a perfect position to deliver on it. How could she not be when she’s responsible for Switzerland’s policies on climate, energy, transportation (including aviation), forestry, environment, spatial planning and (tele)communication. It’s exactly these sectors that need to change for Switzerland to make an ambitious effort in its INDC submission. ECO also seriously hopes the rumor that Switzerland intends to use carbon markets rather than striving for ambitious emission reductions at home is false. How would this fulfill a vision of carbon neutrality? To top it off, Switzerland’s move in Lima to avoid talking about the next steps for climate finance makes it even harder to see how Switzerland can claim to be a champion of environmental integrity. ECO calls on Switzerland to check its watch and realise how late in the day it is for climate action. On this issue, being neutral isn’t a virtue – rather, it’s time for bold action. The Inter-Parliamentary Union (IPU) is taking to distribute pro-active Press releases with information on Democracy For Everyone. IPU urges rejection of Afghan law protecting abusers of women – IPU has called on Afghanistan to reject a new law that would prevent judicial authorities from questioning the relatives of a criminal defendant in a case involving violence against women and girls, making prosecutions highly difficult. Translating human rights commitments into national realities – MPs from Central and Eastern European parliaments will meet in Bucharest on 17-18 February to discuss their role in ensuring international human rights commitments are applied at the national level. At an event jointly organized by IPU and the Chamber of Deputies of the Romanian Parliament, the MPs will examine their parliament’s contribution to the work of the UN Human Rights Council and identify good parliamentary practices in promoting human rights. Although parliaments have a critical part to play in ensuring respect for fundamental freedoms, a survey recently conducted by IPU showed many of them are still unfamiliar with the work of the Human Rights Council or its Universal Periodic Review (UPR), the evaluation mechanism of human rights in all UN member states. Very few of the UPR recommendations are actually implemented without parliamentary action, highlighting the need for MPs to acknowledge the importance of becoming more involved with the work of the Council and of promoting human rights more generally, including by engaging in a more pro-active way with civil society. Strengthening oversight capacities of Oman’s parliament – IPU has been working with Oman’s Consultative Council to strengthen its capacity to oversee government, a fundamental role of any parliament. The move follows the change in the Council’s role from an advisory body to an elected institution with legislative and oversight powers in 2011. An IPU delegation, including parliamentary experts from Britain, France and Germany, covered challenges and procedures for effective oversight, including the use of committees and working with other institutions and the public during a two-day training. This was then followed by an assessment of the priority needs to strengthen the capacity of the Consultative Council in its efforts to fully deliver on its mandate as an elected legislative institution. A more comprehensive needs assessment at a later date could then be used as a basis for a broader IPU programme of support for Oman’s parliament. Advisory Group of the IPU Committee on UN Affairs to visit Haiti – The Advisory Group of the IPU Committee on UN Affairs will conduct a field mission in Haiti on 24-27 February to monitor and report on national parliamentary work to facilitate the stabilization and reconstruction of the country after the devastating earthquake of 2010. The Group will meet MPs, government officials and UN representatives on the ground to assess progress made and pressing challenges ahead for Haitian MPs and parliament in better responding to the needs of the Haitian people. Four years after the 7.3 magnitude earthquake that killed more than 220,000 people and left more than 1.5 million people homeless, major issues such as poor living conditions, food insecurity, malnutrition and cholera remain. The role of MPs in addressing these challenges is crucial as they are responsible for the implementation and oversight of national legislation contributing to the reconstruction efforts. The Advisory Group will examine the UN operations in Haiti concerning peace consolidation and national reconciliation and will build on the increasingly solid partnership between the UN, national parliaments and IPU. The conclusions of the mission will be presented at the 130th IPU Assembly in Geneva, on 16-20 March. To date, the Advisory Group has undertaken seven missions: Tanzania (2008), Viet Nam (2009), Sierra Leone and Ghana (2011), Albania and Montenegro (2012) and Côte d’Ivoire (2013). WTO underlines vital role of MPs in global trade system – WTO Secretary General Roberto Azevêdo has highlighted the vital role MPs play to ensure the good functioning of the global trade system to parliamentarians attending the Steering Committee of the Parliamentary Conference on the WTO in Brussels. “As parliamentarians you connect WTO to the people. We rely on you to take into account their concerns. It is an important link and an important way of ensuring that our global trading system works at the local level,” said Azevêdo. The Committee met on 11-12 February to assess the outcome of the 9th WTO Ministerial Conference held in Bali in December 2013. It adopted a declaration urging negotiators to capitalize on the momentum gathered at Bali where governments agreed to the so called “Bali package”, the first global trade agreement since the WTO was created in 1995. MPs at the meeting also emphasized the need to keep working for a strong and effective parliamentary dimension of the WTO in order to maintain public support for open trade and enhance the transparency of the organization. 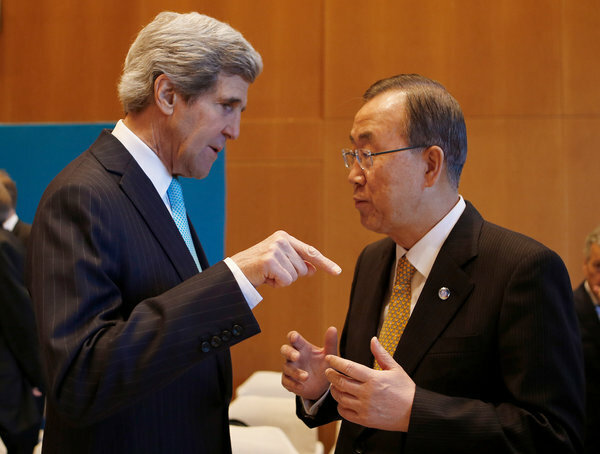 Will the US Secretary of State John Kerry lead by telling UN Secretary General Ban Ki-moon what is expected from him? Ahmad Assi al-Jarba, the president of the Syrian opposition, opened with the story of Hajar al-Khatib, 11, who he said was shot by government forces as she rode a bus to school in Rastan near the city of Homs in May 2011. That was in the early days of the protest movement that set off the uprising. “Ten thousand children have died because of the Syrian Army,” he added, singling out not only Mr. Assad but the army, which many pro-government Syrians distinguish from the political leaders as an object of patriotism. Asked whether the United States had any way of putting more leverage on the Assad government, Mr. Kerry suggested that the Obama administration would support “augmented” support for the opposition, among other options. But Mr. Kerry was vague about those options, and the White House has been extremely reluctant to use force in Syria or to even treat the Syria crisis as its principal foreign policy challenge. On the sidelines, attempts at dialogue turned to scuffles. Outside, pro-government protesters waved the flags of the Syrian government and Hezbollah and chanted “God, Bashar and nothing else!” An opposition activist, Rami Jarrah, approached them with a television camera and interviewed them. But when he asked if Mr. Assad should be tried for war crimes, they began shouting and pushing. We held the above back in a draft format and decided only February 1st to post it. Now we know that the meetings on Syria in Geneva have produced no results, and we also know that the US expressed its opinion that Syria does not cooperate fast enough according to its commitment to give up its chemical weapons. What now for the UN? Are we still going to the Sochi Winter Olympics? The Hatred of Evil – a ncessity – as per Rabbi Shmuley Boteach. Also – Being Popular is Nice but Being Alive is even Nicer and Paul Kagame of Rwanda does not compromise with the Genocidaires. .
Iran’s Rouhani at the World Economic Forum. Photo: Screenshot. 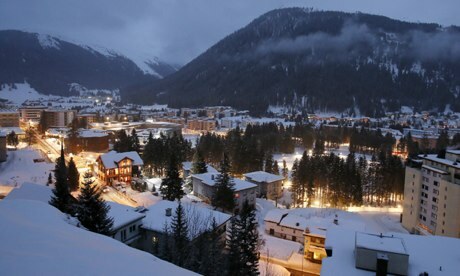 At Davos, where I attended and spoke last week, there was endless talk of a deal between Israel and the Palestinians. According to Martin Indyk, the American special envoy whose panel I attended on Friday, the deal would look like this. Israel gives up the West Bank and returns to the ’67 lines, with land swaps. Israel gives up about half of Jerusalem for the capitol of a Palestinian state (Abu Mazen is demanding the entire old city). Israel offers some sort of unspecified redress on the refugee issue. In return, the Palestinians will guarantee not to make the West Bank into Gaza and will recognize Israel’s right to exist, albeit not necessarily as a Jewish state. Gosh. Why hasn’t Israel said yes before time runs out? But the most painful part of an otherwise illuminating and extraordinary Forum, without question, was Iranian President Rouhani’s speech where he demonstrated an astonishing capacity to lie to one of the world’s most educated and sophisticated audiences, with few in attendance calling him out on his fabrications. The New York Times ran a story on Sunday which showed that nearly everything Rouhani said at Davos was said 10 years earlier by Iranian president Khatami and that Rouhani’s speech was nothing but a regurgitation. Same promises of peace. Same commitment not to pursue nukes or violence. And just as, within a year of Khatami’s speech, Iran was spinning centrifuges, similarly, Rouhani told Fareed Zakaria just three days after his Davos speech that even amid the nuclear deal with the West, Iran will not shut down a single centrifuge. None of this stopped Rouhani from being treated as el numero uno one rock star at Davos. I saw him walking through the halls with his entourage a few times. He was trailed by rushing media. Scores of participants went to say hello. He was easily the biggest draw of the entire Forum, even though, over the past three weeks, Iran has brutally hanged about 40 people in public. Then there was the panel on Syria, which featured key players such as UN High Commissioner for Refugees Antonio Guterres, UN Under Secretary General Baroness Valerie Amos, and former UN Under Secretary General Mark Malloch-Brown. I sat in disbelief. Not one of the speakers was prepared to apportion blame for the slaughter. Not one condemned Bashar Assad for gassing children. Not one made mention of the New York Times front page story that same day which showed graphic pictures of some of the thousands of prisoners that Assad had tortured and starved to death in the most ghoulish fashion imaginable. The panelists spoke of the procedural difficulties of passing a UN Security Council Resolution against Syria without once saying that Vladimir Putin and Russia, arch protectors of the butcher in Damascus, were responsible for blocking every resolution introduced by the United States against Assad. In her last comment of the panel, Baroness Amos actually praised Russia as having been the first to try and pass a resolution that called attention to the humanitarian crisis in Syria. All of which leads to a conclusion I came to years ago. There is no way to make the world a better place without first hating evil. You can’t love the victims of oppression without loathing, resisting and sometimes even fighting the bad guys who oppress them. If you’re indifferent on the brutality of Iran – a country that stones women to death and hangs homosexuals from public cranes – then you have a broken moral compass. And if you’re seriously thinking of leaving Assad in power as part of a “peace” deal then you have utter contempt for his victims. In wanting to be open-minded enough to embrace everybody we have forgotten how to hate anybody. Hatred has its place. There can be no moral neutrality when it comes to things like children being gassed. How can you not feel revulsion, detestation and disgust toward Assad when seeing rows of dead children? I am writing this column on a plane, en route to Auschwitz from Davos, where I will G-d willing participate in the historic visit of the Israeli Knesset to the death camp for the very first time, on Monday. Beyond remembering the victims and paying homage to their sacred memory, are we not meant to be repulsed by the Nazi beast that created this hell on earth? And if we don’t despise them, what will stop this from happening again? At Davos I spent time discussing the upcoming 20th anniversary, this April, of the Rwandan Genocide, with President Paul Kagame, the hero who stopped the genocide in 1994. I told him that at the panel that I moderated between him and Elie Wiesel this past September, he had moved me deeply with his response to my question of whether he trusted the UN and the world to protect his people. Kagame has been criticized by the UN for continuing to fight the genocidaires who fled to Congo. He has resisted great pressure to give up the fight. But as someone who witnessed his people hacked to death in the fastest genocide in human history, he is not out to win popularity contests but to serve as guardian of his nation. The same is true of Prime Minister Netanyahu who drew perhaps a quarter of Rouhani’s audience at Davos and could not compete with the his popularity. If Bibi would just let up about the genocidal threat of a nuclear Iran and say all the right things about peace, friendship and a new beginning he would increase his European popularity by orders of magnitude. But he too, as the head of a nation that 70 years ago watched a third of its number gassed, learned that while it’s nice to be popular it’s even nicer to be alive. The Values Network, which promotes universal Jewish values in media, religion, and culture. Follow him on Twitter @RabbiShmuley. “The Elders (historically – brought together as a highest level intervention group by Nelson Mandela)” – former UN Secretary General Kofi Annan, Martti Ahtisaari of Finland, Desmond Tutu of South Africa, and Ernesto Zedillo of Mexico, will go to Iran from January 26 to 29, to discuss among other things “mutual respect” and peace in the region: that is, Syria. UNITED NATIONS, January 25 — With Syria talks in Geneva surprisingly going forward, with the two sides in the same room not speaking to each other but only to Lakhdar Brahimi – on January 25 “The Elders” made an announcement. Former UN Secretary General Kofi Annan, as well as Martti Ahtisaari, Desmond Tutu and Ernesto Zedillo, will go to Iran from January 26 to 29, to discuss among other things “mutual respect” and peace in the region: that is, Syria. This comes after current UN Secretary General Ban Ki-moon on January 20 reversed his “decision” of the previous day of inviting Iran to the Syria talks in Montreux. The contrast, some say, couldn’t be clearer. In Geneva Syria’s Permanent Representative to the UN, Bashar al Ja’afari, is speaking for the government. On January 20 in the Security Council, Ja’afari complained again of inaction on complaints by Herve Ladsous, the fourth French head of UN Peacekeeping in a row. Ending the Syria speeches in Montreux on January 22, Secretary General Ban Ki-moon called them “productive.” Then his spokesperson accused some non-Western media of being “disrespectful of the Secretary General of the UN,” after he gave the last two questions to Bloomberg and NHK (the Japanese government run television network.) How was it productive? Fabius in September, at the UN, declared Ahmad al Jarba the leader of the Syrian people, and refused to take critical questions from the media including about his country’s practices. Australia was represented not by foreign minister Julie Bishop but rather its Ambassador to the UN in Geneva, Peter Woolcott (who also chairs a humanitarian high level group on Syria, it’s been pointed out to Inner City Press.). Bishop is in Washington, and soon to be in New York. Ahmad al Jarba spoke before the last, thanking Saudi Arabia, viewed as his sponsor, as if in an Oscars speech. Ban Ki-moon wrapped up, calling it productive and asking the assembled (hand-picked, without Iran) ministers to “wish [him] luck” as he went to speak to the media. When John Kerry held his press conference, only four questions were taken: CBS, a Turkish media, BBC and Al Hurra, on whose Broadcasting Board of Governors John Kerry himself serves. After the UN’s reversal on including Iran in the Syria session in Montreux, it has turned out to be a series of speeches mostly by countries significantly less important to that conflict and the region. In the morning session on January 22, Italy and Spain spoke and Japan offered money. Turkey spoke without mentioning the Kurds — but neither did supposed representative of the range of Syrian opposition leaders – Mr. Ahmad al Jarba. CAN THE ELDERS OBTAIN THAT MAGIC FROM TEHRAN THAT IS NEEDED TO ALLOW THEM A PLACE AT THE SYRIA NEGOTIATIONS’ TABLE FROM WHICH THEY ARE KEPT AWAY BASICALLY BECAUSE THE NEGOTIATIONS ON THEIR NUCLEAR WEAPONS HAVE NOT MADE THEM CLEAN YET? CAN KOFI ANNAN PROVIDE THEM THE NEEDED “RESPECT” SO THEY CLIMB DOWN THE NUCLEAR LADDER SAYING THAT A REGION OF PEACE IS WHAT THEY WANT? Can Iran be made Salon-Clean before it came out clean in its nuclear posturing? Can Russia succeed with Sochi without first taking clean attitudes on Islamists of all stripes? Do we enter new areas that need SUSTAINABILITY? The following is by now old hat but we decided to post it anyhow – this because it is still the base for understanding the surrealism of the Syria Geneva II meeting that just started with a Montreux, Switzerland, introductory. We believe that Iran belongs to the meeting – so do the Kurds. But Geneva I deemed that the meeting is basically between the Assad government of Syria and a “UNIFIED” opposition delegation that in reality does not exist. The Syrian National Coalition (SNC), that is headed by Mr. Jarba is a Saudi/Qatari pupp.et – they are backed only by half of the Turkey based leadership, and do not include the Kurdish held territory at all. That is the Turks’ contribution to the Syrian/Iraqi mess. Russia – the other P2 that with the US and the UN is in the driver’s seat of these meetings has its own Islamic problem in the Caucasus and in more central parts of Russia along the Volga river – they like to back the Assad regime for their own reasons but want no part of his other backers like Islamic Mullahs of Iran. To start making sense Iran will have to come clean on its nuclear dealings with the West – so the US will allow them participation at the Syrian table and this is what we mean by making themselves Salon Clean. Without this there is no progress in their relations with the UN and the West on any issue. They may think that time is in their favor and might try to play as outsiders against everyone at the Geneva table. Russia on the other hand does not have the luxury of time – this because of the Sochi winter games and surprise – their internal nemesis are training now in Syria and the US might just decide that if the Russians are not supportive of the West’s goals in the Middle East – why play their ski slopes at all? That would be a terrible set-back to ambitious Mr. Putin. The drama is thus that nobody gives a damn about Syrian lives when pursuing their own particular goals and our true cynicism is revealed in the greater interest we saw in the Davos World Economic Forum meeting then in any of the Middle East negotiations. The announcement by Ban Ki-moon, the United Nations secretary general, that he had invited Iran to a peace conference to end the war in Syria drew strong objections on Sunday from American officials, who suggested that Iran had not met all the conditions for attending and that the invitation might need to be withdrawn. “If Iran does not fully and publicly accept the Geneva communiqué, the invitation must be rescinded,” Jen Psaki, a State Department spokeswoman, said in a statement. Officials in Washington emphasized that Iran had made no such public statement at the time of Mr. Ban’s news conference. It was expected to release one early Monday. If Iran has accepted the Geneva terms, it would be a sharp turnaround, since it has long insisted that it will participate in talks only if there are no preconditions. Still, such a shift would not necessarily mean Tehran had accepted that President Bashar al-Assad must leave office. Some 30 countries have been invited to Montreux for what may be a largely ceremonial opening day of the peace talks. Two days later, Syria’s government and opposition delegations will move to Geneva to continue the deliberations, mediated by a United Nations special envoy, Lakhdar Brahimi. Diplomats and Middle East analysts say that if there are any breakthroughs, they will take place in Geneva. The negotiations are not expected to yield major results, except perhaps to open up certain parts of Syria to the delivery of humanitarian aid, which has been long denied. Iran’s participation has been a subject of intense diplomatic wrangling for several weeks. Mr. Ban and Mr. Brahimi have insisted that Iran, given its considerable influence over the Assad government, should be part of the negotiations. So has the Syrian government’s other major ally, Russia. The United States has long been wary of Iran’s intentions. Tehran has been one of the Assad government’s staunchest political and military supporters, sending arms to Damascus and encouraging Hezbollah, the Lebanese Shiite militia, to join the fight on the side of Mr. Assad. As recently as last Monday, Secretary of State John Kerry complained that Iran was, effectively, a belligerent in the conflict. Iran’s inclusion has the potential to turn the Syria peace talks into a platform for intensifying Middle East conflicts. Also represented will be Saudi Arabia, Iran’s chief rival. Andrew J. Tabler, an expert on Syria at the Washington Institute for Near East Policy, said Iran’s presence “seems to widen the circle of regional involvement.” But he also noted that Iran and the United States could be expected to hold diametrically opposed views as to whether Mr. Assad must give up power. “Given that Iranian forces and their Shia militias are deployed on the ground backing up Assad, it means another Assad backer will be present at this meeting,” Mr. Tabler said. Syria’s political opposition said in a Twitter message that it would not attend unless Mr. Ban withdrew Iran’s invitation. “The Syrian coalition announces that they will withdraw their attendance in Geneva 2 unless Ban Ki-moon retracts Iran’s invitation,” the Twitter message said, quoting Louay Safi, a coalition spokesman. The ultimatum came just a day after the coalition, facing a boycott by a third of its members, had voted to send a delegation to the peace talks. The opposition has been under intense international pressure, including from the United States government, to participate. Mr. Ban said Sunday that he had spoken extensively with Iran’s foreign minister, Mohammad Javad Zarif. “He has assured me that, like all the other countries invited to the opening-day discussions in Montreux, Iran understands that the basis of the talks is the full implementation of the 30 June, 2012, Geneva communiqué,” Mr. Ban said. Somini Sengupta reported from New York, and Michael R. Gordon from Washington. AMAZING! Netanyahu and Rouhani park their planes next to each other going to the Davos World Market and it seems that the governments of Iran and Israel agree that Iran promised nothing really to the Americans as claimed by the November release from Washington. THE WORLD IS FICKLE AND FULL OF THE POTENTIAL FOR SURPRISE. Netanyahu, Rouhani Planes Parked Next to Each Other at Davos – according to Bloomberg. Photo: Screenshot / Gwen Ackerman. As a true sign of the global connectivity taking place in Davos this week at the World Economic Forum, Bloomberg News published a picture worth a thousand words – the planes of the Israeli and Iranian delegations parked next to each other at Zurich International Airport. “Netanyahu and Rouhani planes find themselves side-by-side at Zurich airport as both head to Davos,” John Fraher, Bloomberg’s Managing Editor for Europe, Middle East and Africa tweeted on Wednesday, linking to the picture. Israeli Prime Minister Benjamin Netanyahu said he was bringing a delegation of some 100 leading Israeli businessmen to the event, where he has meetings scheduled with the corporate leaders of Yahoo and Google. Presumably, Iranian President Hasan Rouhani is attending to interest world business leaders in the Iran economy, recently opening up for business after the Islamic Republic formally inked a nuclear treaty with world powers, led by U.S. Secretary of State John Kerry, this week. As part of the deal, Iran was required to dilute its stockpile of uranium that had been enriched to 20%, well above the 5% level needed for power generation but still below the level for developing a nuclear weapon. The B Team is a not-for-profit initiative formed by a global group of leaders to create a future where the purpose of business is to be a driving force for social, environmental and economic benefit (that is what we call SUSTAINABILITY). They will meet at this year’s World Economic Forum in Davos, Switzerland. Now this is a Guardian of the UK blog – and as you know they are the journalistic outlet that made WikiLeaks and Snowden famous – we give them a lot of credit for perpetuating good journalism – so when we found the following in an e-mail from UN Wire of the UN Foundation we tended to give it credibility. We do indeed expect the UN Foundation to be business oriented with a fresh breaze of air – that is SUSTAINABLE BUSINESS when Sustainability is understood as a way for the future and not just an issue of profitability for this moment. The posting is about the ongoing meeting of the World Economic Forum in Davos, Switzerland and we understand that the B – TEAM is the Sustainability team for World Economics of a more sustainable World. They lack neither influence, nor the ability to use it. But there is one asset that business leaders at the World Economic Forum this week could usefully exploit further: the power to advance the wider interests of people and planet. in 2015 – business needs to engage. When the UN decided on its Millennium Development Goals, aiming to reduce poverty and improve quality of life in developing countries, businesses were not at the table. Today their contribution to some of the initiative’s successes is widely recognized. Today, there are nearly as many mobile phones as there are people, and 39% of the world’s population already uses the internet, dispersing knowledge and economic opportunity, driving collaboration and helping to respond to the needs of the 1.4 billion people still in extreme poverty. Traditional business practices have brought new services, jobs and well-being to many communities in recent decades, while sustainable business practices have often helped a company’s image and bottom line. But with increasing inequality, volatility and resource scarcity, there is a real chance the gains in prosperity of the past fifty years will be lost to future generations – with the greatest burden falling on the world’s poor, those least responsible for causing the problems. Business must go further, redefining its responsibilities and terms of success, embracing the need for equitable opportunities, fair returns to work and respect for the environment alongside profit and growth. Both innovation and concerted action are needed to accelerate business practices that promote true transformation. Many managers may be unaware of the side effects of their decisions, or lack incentives to address them. Education in new management practices can help, as well as the measurement of environmental and social impacts, improved governance and increased transparency. . . . . . Organisations such as the UN Global Compact and the World Business Council for Sustainable Development have also launched important initiatives that businesses can join and learn from. This version of the future – not that of a blighted planet – is fundamentally in the interests of business. Executives must rise above narrow sectoral and short-term interests, and work with governments to create a new framework of incentives and sanctions, rewarding investment in people and planet. It is time that they take the initiative at their own companies, and together with politicians of courage and conviction, drive towards a global goal of sustainable, inclusive prosperity – at the UN general assembly, in Paris next year, and beyond. Join the community of sustainability professionals and experts. Become a GSB member to get more stories like this direct to your . What lies ahead for the economy in 2014? What does citizenship mean in the 21st century? How can we have an honest conversation on climate change? How can we build more resilient cities? Arnold Schwarzenegger’s Climate Action Rainbow called Regions 20 (R20) stretches from Santa Monica to Geneva. What Governments may be too weak to do – chunks of Regions and the Private Enterprise may be able to achieve easier. The R20-Regions of Climate Action is a non-profit organization founded in 2010 by Governor Arnold Schwarzenegger and other global leaders in cooperation with the United Nations. The R20 is a coalition of partners led by regional governments that work to promote and implement projects that are designed to produce local economic and environmental benefits in the form of reduced energy consumption and greenhouse gas emissions; strong local economies; improved public health; and new green jobs. These local actions can help the world achieve our shared global environmental and economic goals. Note: Bold denotes founding member. Schwarzenegger flexes green muscles in Geneva. The war against climate change must become “hipper” to interest more people, says former California governor Arnold Schwarzenegger. The Hollywood action hero was in Geneva this week in his latest role as green activist to inaugurate his R20 non-profit environmental group, which has established a headquarters at Versoix, on the city outskirts. During his three-day visit Schwarzenegger broke Geneva University audience records at a public conference on his latest “crusade” – climate change and the economy. On Wednesday night 2,000 people packed into the main university auditorium and two separate conference rooms were opened especially to broadcast the Governator’s live performance. “I won’t stop until we’ve spread our green revolution everywhere,” he told the audience. Schwarzenegger served as governor of California from 2003 until 2011, during which time he became steadily more committed to green policies. In 2006, California became the first US state to place a cap on greenhouse gases. The 64-year-old hammered home his message about better communication on climate change and greenhouse gases. Communication should be like a “four-legged stool” and not the current one-legged version based solely on climate change, said Schwarzenegger. The second leg should be about jobs, as “the green economy is a growing economy”, and the third and fourth must focus on national security and health. “Clean economies can save millions of lives,” he pointed out. Citing Nelson Mandela and Mahatma Gandhi in his speech, he said citizens could not hang around waiting for governments to seal an international climate change accord. “There are countries, states, cities and people who think they can’t create a green energy future without an international agreement. I’m on a crusade to change that,” he declared. Schwarzenegger’s R20 brings together a diverse alliance of 30 city and regional governments and partners “to develop, finance, implement, evaluate and replicate low-carbon and climate-resilient projects on a worldwide scale”. The long-term objective is to increase that to 200 regions with green investments worth $100 billion by 2017. Members include regions in Mexico, Nigeria, India, Brazil, South Korea, California, British Columbia, and the Parisian Ile-de-France area. Launched in December 2009, the public-private group, which held its first general meetings in Geneva this week, is all about action, said Schwarzenegger. “Our task is a daunting one which is growing exponentially. But there are fantastic things happening all over the world. It’s about moving ahead on the subnational level instead of waiting on the sidelines,” he added. Michel Jarraud, secretary-general of the World Meteorological Organization (WMO), agreed that regions had a “key role to play” in climate change efforts. One of the R20’s aims is to spread knowledge of the benefits of clean energy. “We will make sure the people of Delhi to know about the great things being done here in Switzerland and we want to help provinces in Morocco learn about technologies from California,” said the former governor. A number of projects are underway, such as more efficient public lighting, and a “cool roofs” initiative – the installation of white roofs, which reflect the sun and keep houses cool. Martin Beniston, head of the Institute of Environmental Sciences at Geneva University, said the R20 was a “key example of actions in favour of the environment that open up opportunities for local and national economies”. The R20 is also behind the ‘Sustainia’ collaborative project, a virtual model of the world that could be created if ready and available solutions are implemented to existing cities, homes, energy systems and transport. ‘Sustainia’ will be presented to world leaders in June at the Rio+20 Summit in Brazil, alongside “Sustainia100”, a catalogue of 100 ideal solutions and technologies. “Sustainia is all about showing how easily the future could be different from, and better than, today. It’s based on facts: we have clean technologies right now, and science tells us that using them would bring all kinds of benefits,” Sam Smith, global leader of WWF’s Climate and Energy Initiative, told swissinfo.ch. Versoix was chosen as the R20 headquarters due to the concentration of United Nations specialist environmental agencies, as well as NGOs like the WWF, the International Union for the Conservation of Nature and the World Economic Forum, as well as private banks. Canton Geneva will assume the R20’s rental costs for the first two years under a policy of encouraging NGOs to establish themselves in the region. The group plans to open offices in China and Rio de Janeiro. Franz Perrez, head of international affairs at the Federal Environment Office, said he was delighted Schwarzenegger had chosen Geneva. He agreed that there was a “desperate need” for bottom-up approaches, but added that looking at those alone would not be sufficient. Born in Austria on July 30, 1947, he holds dual Austrian-US nationality. He stormed the world of bodybuilding winning the Mr Universe title at the age of 20 and went on to hold the Mr Olympia title seven times. He gained world fame as an action film icon in movies such as Conan the Barbarian, The Terminator, Last Action Hero, The Running Man, Twins, True Lies, Batman & Robin. He is back working on a series of new films. He was governor of California from 2003 to 2011 serving two terms. In 2006, California became the first US state to place a cap on greenhouse gases. The law set new regulations on the amount of emissions utilities, refineries and manufacturing plants are allowed to release into the atmosphere. Schwarzenegger also signed a second global warming bill that prohibits large utilities and corporations in California from making long-term contracts with suppliers who do not meet the state’s greenhouse gas emission standards. The two bills are part of a plan to reduce California’s emissions by 25 per cent to 1990s levels by 2020. In 2005, Schwarzenegger issued an executive order calling to reduce greenhouse gases to 80 per cent below 1990 levels by 2050. As a signatory to the Kyoto Protocol, Switzerland in 1997 committed itself to reducing greenhouse gas emissions. In an initial phase CO2 emissions were to be reduced ten per cent over 1990 levels by 2010. The government foresees raising the target to at least a 20 per cent cut in emissions by 2020, partly through a CO2 tax, an emissions trading system and compensation measures outside Switzerland. Parliament approved the 20 per cent target, but wants cuts to be achieved through measures within Switzerland only. Discussions are continuing on extending the CO2 tax from heating oil, gas and coal to also include petrol. Environmental groups collected enough signatures for a nationwide vote on separate proposals for a 30 per cent cut in emissions. The EU, which does not include Switzerland, has also set 20 per cent emission cut targets. Rare Victory For Israel: Swiss Foreign Ministry U.N. Nominee Jean Ziegler Disowned By Swiss Parliament; Attacked UN Watch for Exposing His Ties to Dictators. Great news: the Swiss Parliament’s Foreign Affairs Committee has just passed a Non-Confidence Motion against Jean Ziegler, rebuking their own government’s “inappropriate” nominee for the U.N. Human Rights Council. In a country known for diplomacy, it’s an unprecedented public embarrassment for Ziegler, who as a UNHRC official from 2000 to 2012 was the most rabid supporter of tyrants, terrorists and anti-Semites in U.N. history. After a decade using his U.N. post as a propaganda tool for dictators, Ziegler was forced out last year. Now he’s trying to come back, to regain influence — and diplomatic immunity, so he can say nonsense without being sued. Thanks to UN Watch, the Swiss government’s latest nomination of Ziegler—designed to win U.N. favors from Third World dictators—was exposed to the world, and he was quickly shamed. US-SWISS relations are all business constrained by the Swiss understanding of democracy, neutrality, isolationism, and the reach-out to the rest of the world. We are directly interested in the topic as years ago – to be exact September 2003 – we sponsored Swiss Member of Parliament Roland Wiederkehr for an NGO/DPI Conference on a topic of the Global Environment and Security. His position was prescient and all in favor of what we call today Sustainable Energy and at the time it was just Renewable Energy. Further, recently we wrote about the Swiss involvement in the upcoming debate at the UN on Migration which has to be linked to the effects of Climate Change. More information about Switzerland is available on the Switzerland Page and from other Department of State publications and other sources listed at the end of this fact sheet. The United States established diplomatic relations with Switzerland in 1853 following the formation of a unified Swiss state. Switzerland is a democratic country subscribing to the fundamental ideals with which the United States also is identified. The country is politically stable with an essentially strong economy. It has played an increasingly important role in supporting the spread of democratic institutions and values worldwide, as well as providing humanitarian relief and economic development assistance. U.S. policy toward Switzerland takes these factors into account and seeks to cooperate with Switzerland to the extent consistent with Swiss neutrality. The United States and Switzerland have signed a number of agreements creating mechanisms that deepen cooperation and improve the relationship: the Enhanced Political Cooperation Framework, the Trade and Investment Cooperation Forum, and the revised Operative Working Arrangement on Law Enforcement Cooperation on Counterterrorism. The centerpiece of the Enhanced Political Cooperation Framework is an annual senior-level meeting, the Joint Working Group. Another vehicle for bilateral cooperation is the U.S.-Swiss Joint Economic Commission, which covers anti-money laundering efforts, counterterrorism, regulatory cooperation, and intellectual property rights, among other topics. The United States provides no development assistance to Switzerland. Switzerland is a member of the European Free Trade Association, whose countries are significant markets for U.S. exporters and investors. The two countries have a long history of cooperation both bilaterally and within the World Trade Organization. The United States is one of the top destinations for Swiss investment and is one of the largest foreign investors in Switzerland. The United States and Switzerland have signed an agreement creating a trade and investment forum to assess areas where the two governments could facilitate greater trade and investment flows. U.S. exports to Switzerland include gold, pharmaceutical products, art and antiques, optic and medical instruments, machinery, and agricultural products. U.S. imports from Switzerland include pharmaceutical products, optic and medical instruments, clocks and watches, machinery, jewelry and diamonds, and agricultural products. Per capita, Switzerland is among the countries with the most visitors to the United States every year. Switzerland participates in the Visa Waiver Program, which allows nationals of participating countries to travel to the United States for certain business or tourism purposes for stays of 90 days or less without obtaining a visa. Switzerland and the United States belong to a number of the same international organizations, including the United Nations, Euro-Atlantic Partnership Council, Organization for Security and Cooperation in Europe, Organization for Economic Cooperation and Development, International Monetary Fund, World Bank, and World Trade Organization. Switzerland is also a member of the North Atlantic Treaty Organization’s (NATO) Partnership for Peace program and is an observer to the Organization of American States. The position of U.S. Ambassador to Switzerland is currently vacant; other principal embassy officials are listed in the Department’s Key Officers List. Switzerland maintains an embassy in the United States at 2900 Cathedral Avenue NW, Washington, DC 20008; tel. (202) 745-7900. Does the UNFCCC Secretariat try to influence CDM rulemaking due to the massive growth in Secretariat resources? The CDM revenues have led to a massive resource inflow for the UNFCCC Secretariat, covering more than half of its budget. Using document analysis, interviews and regression analysis, we show that the UNFCCC Secretariat, at least in areas that require technical expertise and that are politically not overly contentious, can gain substantial influence over concrete CDM-related policy decisions and even change the structure of decision making and consultation processes. We also show that this may reinforce rather than reduce the role of special interests expressed via country delegates in the CDM EB. While one might be worried about the erosion of democratic principles at the international level, from a normative perspective, the overall effect is difficult to assess. If the international UNFCCC staff is well trained, technically competent, and committed to the delivery of the global public good of climate change mitigation, its increasing autonomy and influence may also be socially advantageous. 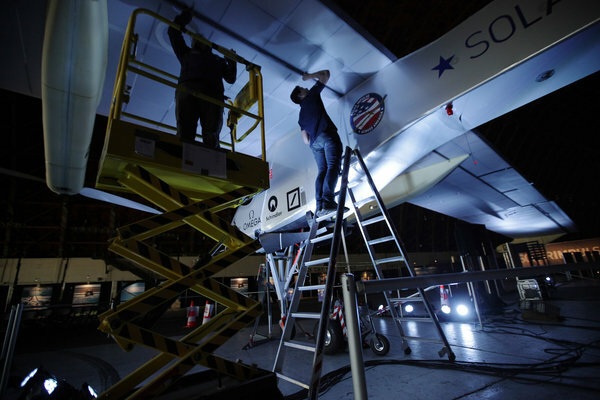 Solar Energy alone – to energize a plane that flies day and night. A dream made now for real by a Swiss team in the US. 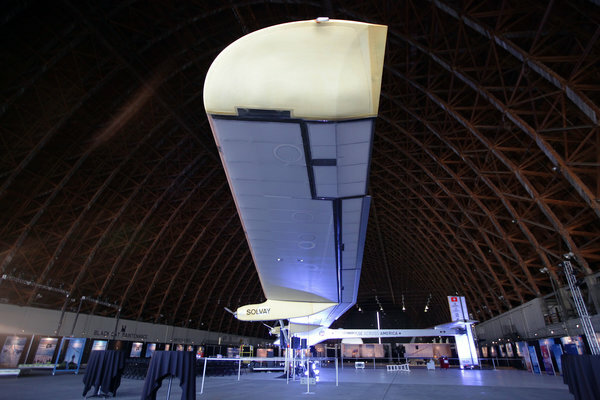 Cross-Country Solar Plane Expedition Set for Takeoff. The Solar Impulse is powered by about 12,000 photovoltaic cells that charge its batteries, letting it fly day and night. 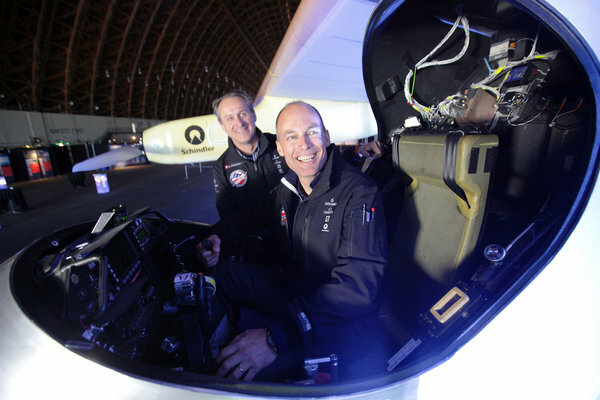 MOUNTAIN VIEW, Calif. — When Bertrand Piccard was growing up in Switzerland, heady discussions about the boundless potential for human endeavor were standard fare. His grandfather, a physicist and friend of Albert Einstein and Marie Curie, had invented a special capsule so he and a partner could be first to reach the stratosphere in a balloon. His father, an engineer, helped design the submarine that made him and an American naval officer the first to plunge undersea to the earth’s crust. He went on to become part of the team that was first to circumnavigate the globe nonstop in a balloon. But when a propane shortage nearly ended his record-setting ride in 1999, he began dreaming of a way to fly day and night without fuel, an idea that has reached fruition in a featherweight solar airplane set for an initial voyage across the United States starting on Friday, weather permitting. His brainchild, the Solar Impulse, will not be the first sun-powered plane to fly; its chief distinction is its ability to go through the night. Conceived of as a grand demonstration of what can be done with clean technologies — a Jules Verne-style adventure with a dash of P. T. Barnum thrown in — the project has more practical implications. While it could be decades, at least, before ordinary travelers line up to board solar electric planes, the technology is under consideration for drones, which risk damage each time they land to refuel. Another venture’s solar electric plane, which seats two and could one day find a place in the sport aviation market, made its debut last week in Germany. The Sunseeker Duo from Solar Flight (founded by Eric Raymond, who also worked on the Solar Impulse project) can fly for about 12 hours at a time, said Eric Lentz-Gauthier, a pilot and spokesman for the company. And some of the technologies developed for Solar Impulse — which has a wingspan matching that of a 747 but the weight of a midsize car — are already set for commercial use, including the special batteries used to store the solar energy and the foam that insulates them. The cockpit will fit only one, so Mr. Piccard will trade legs of the journey with his partner, André Borschberg, an engineer and entrepreneur who was a jet fighter pilot in the Swiss Air Force, flying at about 45 miles per hour for 18 to 20 hours at a time. The aircraft could theoretically fly continuously, but the pilots — despite Mr. Piccard’s apparent skill at self-hypnosis and Mr. Borschberg’s explorations of yoga and meditation — cannot. “We have a sustainable airplane; now we have to build a sustainable pilot,” said Mr. Borschberg at a presentation at Stanford University later that day. So flight legs are limited, since the plane’s extreme sensitivity to turbulence demands a pilot’s direct attention. The men plan stops in Phoenix, Dallas, St. Louis and Washington before a final landing at Kennedy Airport in New York around the end of June. The voyage is a precursor to a planned trip around the globe in 2015 for which the team is building a second plane, adding adjustments like an autopilot and reclining seat, to help them fly for as many as five days straight. The two first met after Mr. Piccard presented his idea for fuel-free flight to the Swiss Institute of Technology, which put Mr. Borschberg in charge of studying the project. 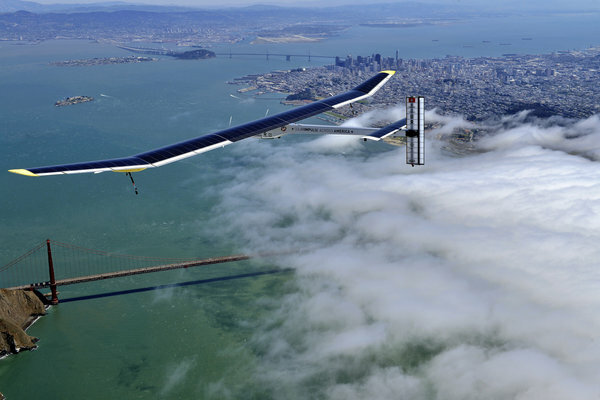 He ended up overseeing the aircraft’s design and construction, including its nearly 12,000 solar cells. Mr. Piccard turned to raising the $140 million in financing and sponsorship to support it (“Like in every couple, I was bringing the money in and André was spending it.”). Solar Impulse borrows technologies from industries like semiconductor and boat manufacturing, Mr. Borschberg said. Constructed of a carbon fiber frame, monocrystalline silicon solar panels and a sheer, silver carbon wrapping, the plane is tough enough to reach almost 30,000 feet but so fragile you could put a finger through it. “Everything is so efficient that we can fly only with the sun that we collect in the airplane,” he said. For Mr. Piccard, the project represents another genealogical milestone. Like his grandfather and father before him, he is driven to be a pioneer. As a child, he said, he met Charles Lindbergh and heard the stories of his grandfather, who died when he was 4. He read books about exploration and space travel, building model planes and rockets, and he also learned from talking with his mother, the daughter of a cleric, about spirituality, philosophy, religion and the meaning of life. A temporary move to Florida during the launches of several Apollo space missions proved influential. But when he returned to Switzerland, he said, the American space program was in a lull so he turned to plumbing the depths of the mind instead, and became a psychiatrist. Still, he kept one foot in the world of physical exploration, he said, always trying new ways of floating through the air, including hang gliding and ballooning. He did not train as a balloon pilot, though, until he was invited in 1992 to join a trans-Atlantic race because the pilot wanted a psychiatrist aboard to help him sleep and manage stress. Mr. Piccard loved it, he said, and saw a metaphor for life in an endeavor where the only way to steer was to change altitude, sometimes by shedding weight, throwing sand overboard. The Government of Mexico and NGO’s call for a Press Conference Monday March 25, 2013, at the UN in New York, on an Arms Trade Treaty that an Arms Control Coalition Wants but many States Oppose. Can the UN be saved? Press conference: Arms Trade Treaty with Control Arms coalition MONDAY 25 March, 2013. Press conference on the Arms Trade Treaty. Midway through the diplomatic conference, the Control Arms Coalition gives a critical analysis of the latest draft of the text, which was published on Friday March 22. Axel Michaelova has opened in Zurich Perspectives GmbH that will advocate the Arab OPEC (OAPEC or AOPEC) take a more positive position to UNFCCC at the COP 18 meeting on home court at Doha, Qatar, November 26 – December 7, 2012. The UN has moved THE WORLD ENERGY FORUM to Dubai in October 2012. This is the first article that reaches us from PERSPECTIVES GmbH, Zurich, and it seems intended to save UNFCCC in the Post-Rio atmosphere when we see the UN reach out to novel ways of dealing with CO2 emissions. These new attempts do not call for decisions by consensus that were easily defeated by a feisty Saudi representative. The simple fact that future generations of Saudis could benefit from a Saudi cooperation with those that tried to decrease the Global use of oil by inserting an oil use decrease for the common good, was anathema to the present robbers of the Saudi National resource – also to the corporations in the US and elsewhere that do business with them. Will a budding middle class change the Gulf States as it is changing the Financial BRICs? Will there be young Princes that are ready to join global progressive thinking and be patriotic at the same time? If so, Perspectives might become the greatest Madison Avenue PR company, and it is good they put their office in Zurich. in the run-up to COP 18 in Doha, Axel Michaelowa and Mari Luomi put a spotlight on climate policy of the Gulf states: Given surging domestic energy consumption that is increasingly threatening oil and gas export revenues, the United Arab Emirates, Qatar and Saudi Arabia are initiating multiple experiments to improve energy efficiency and introduce renewable energy. Cautious signals of a more constructive engagement of the Gulf Cooperation Council states in the international climate policy regime are emerging. The resulting opportunities for constructive and innovative dialogues should not be wasted. Climate diplomacy should try to strengthen the position of those groups that support new domestic energy policies. Technical support for Nationally Appropriate Mitigation Action (NAMA) pilot projects by the EU and other progressive countries in the climate regime could serve as a catalyst for creating sustained synergies between new energy and climate policies in the Gulf region. The World Energy Forum, which is being held for the first time outside UN Headquarters in New York, seeks to bring together world leaders, international organizations, financial institutions and other stakeholders to discuss progress towards cleaner, safer and more sustainable energy as well as how to achieve universal access to modern energy services. As 2012 has been designated as the International Year of Sustainable Energy for All, one of the main objectives of the Forum is to chart a roadmap for a sustainable energy mix that can fuel global economic and social development.